The premier track and field league, the Diamond League, allots points to the first, second, and third place finishers in the diamond events, and the “winners” at the end of the season are those with the highest cumulative scores in those events. Those individual results are the trees. We want a view of the forest, too. The most obvious “teams” that can be formed from these individual Diamond League results are by nation. We’ll limit the current post to distance events: the 800, 1500/mile, 3000/5000, and steeple. We’ve tabulated the points for the first four Diamond League meets — the fifth meet is taking place in Rome today. The U.S. points are entirely the work of one runner, Brenda Martinez, with her 2nd place at the 800 in Eugene and her 3rd at the 1500 in NYC. The closest that American men have gotten to the scoreboard was Ben True‘s 4th at the 5000 in NYC and Evan Jager‘s 4th in the steeple at Eugene. Duane Solomon will be running the 800 in Rome. The prize money leaderboard through the four meets offers a more expansive view, as prize money is allotted through eighth place in each race, rather than solely the top 3 for the points. 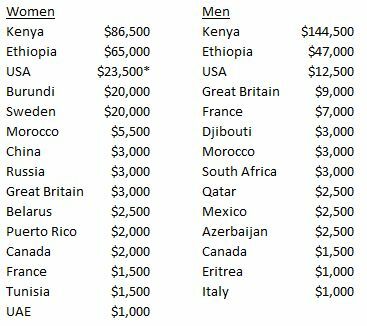 * Note that the US prize money for women includes the $2,500 that Mary Cain would have won had she accepted it. The money was not in fact distributed to her, as it would muddle her potential college eligibility.